Blond, sandy beaches. Azure water that feels like you’re soaking in a bathtub. Lots of North American tourists. Aruba has a splendid setting. Unfortunately, everyone knows it. Eagle Beach, with its calm, shallow water, may be one of the Caribbean’s most beautiful beaches, but it’s also one of the most popular. Except this time of year. During the summer months, those North American tourists start traveling to beaches closer to home. And when news of the first big hurricane arrives, many people stop planning Caribbean trips. But the Dutch island of Aruba is outside of the hurricane belt, so tropical storms are a lot less prevalent. Now may be the best time to find an empty lounger, order a piña colada, and have a gorgeous stretch of sand almost to yourself. To ensure peace and quiet, check into the adults-only Bucuti & Tara Beach Resorts. 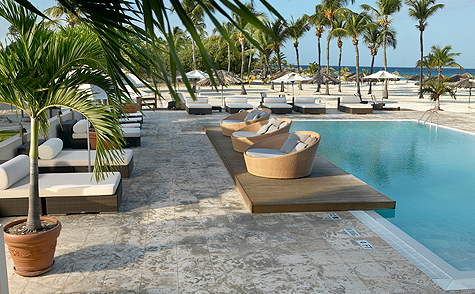 The suites in the low-rise, Spanish Colonial buildings sit right off the beach. Enjoy ocean views, trade winds, and perfect sunsets right from your balcony. After sleeping in–you can do that when you don’t have to race for a lounger in the morning–book a coffee body scrub at the spa. Grab a panini-style Dutch tosti for an early lunch. And spend the afternoon touring the island’s rugged terrain in a Jeep. Unlike most Caribbean islands, which are humid and covered with rainforests, Aruba is an arid desert. The island is full of southwesterly facing (due to the trade winds) divi-divi trees, mondis (forests of cacti), and white and purple magdalenas, which don’t need much water. Travel to the windward side of the island, stopping at the secret Natural Pool. Waves pound the rocks, but they can’t quite reach the calm, enclosed area. Visit gold-mining ruins and Mount Jamanota, the island’s highest peak, in Arikok National Park. And hike to the Casibari Rock Formations. Now sweaty and ready for a drink, return to the resort for happy hour at the Sand Bar. A Balashi beer and a quick swim will cool you off. There are plenty of restaurants along Eagle Beach for dinner. Or for a romantic treat, eat in a private cabana on the beach. Champagne, snapper with lemongrass beurre blanc sauce, and heavenly chocolate cake as the sun sets. 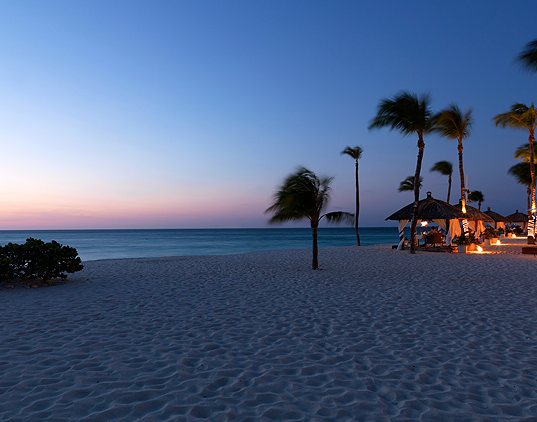 Cap off the evening listening to steel drums as you stroll hand in hand along the empty beach. You’ll definitely return to Aruba again. But only after everyone else leaves.